Student 1- “Mother Art definitely challenged the notion that to be a contributing feminist artist, they had to be single and childless. That once they had children and a husband, they were no longer useful to the movement. 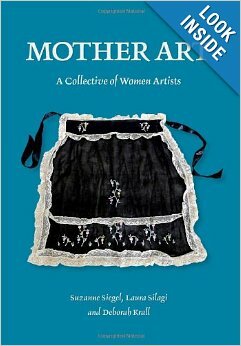 When several of the mothers were told they would not be able to make great art until they rid themselves of their family, the women banded together and created their own art movement that not only was more inclusive and showed another side of feminism, but also that they wove in political issues, and made the issues relatable to all, not just to women. An example of this would be L.A Guernica, a reinterpreted version of Picasso’s Guernica, that was installed in Los Angeles landmarks to demonstrate against the massive build up of nuclear weapons. I also loved how proud the mothers were of the Rainbow Playground. That it was their first piece together, and how empowered the women felt building the playground and working machinery they had never used before. This work challenged the need for a man, that these mothers, with children, were able to make something successful on their own. Student 2- “I enjoyed the Mother Art Collective film. Before this class I didn’t know about them, so I learned all about them! I like how, as the title says, they tell their own story of their history, just like how they told the stories of women back in the day. They expressed not only their experiences with early works like By Mothers and Laundry Works, but the lives of others through their “the personal is political” works as well. Mother Art challenged mainstream feminism by first creating works about mothers since they weren’t welcome in the feminist studio workshop at the Woman’s Building, and continued to create works about other oppressed groups (homeless women, abortion patients, Central American woman refugees, etc). Student 6- “The Mother Art Collective was a progressive group of artist, femininist, activist, and most importantly mothers. One of their pieces was the L.A. Guernica installation that was in the federal building in L.A. (only for a short time). This piece got its inspiration from Picasso’s piece about Guernica, Spain. The Mother Art Collective took this inspiration and created a 3D installation representing the aftermath of a nuclear bomb and had images of mother and children. It showed the contrast between life and death. This installation “offended” people at the Federal Building and so they were asked to remove it. Student 7- “From 1960-the present there have been many Feminist artists and collectives that have made a huge influence on the women’s movement, as well as political movements. One of the groups that we discussed in class was the Mother Art Collective; this group of women made an influence on the art world as well as the women’s movement for mothers in the 70’s and 80’s. They were against the idea that if women were mothers that meant they should just stay home and take care of their children and nothing else. And if they wanted to be successful artists the only way they could do so, was by leaving their family behind and solely work on their art. They set out to prove that mothers could do both and do it well. The Mother Art Collective consisted of 8 (Velene Campbell, Jan Cook, Gloria Hajduk, Deborah Krall, Christie Kruse, Helen Million, Suzanne Siegel, and Laura Silagi) mothers who were artists, that were previously trying to be apart of a women’s art collectives in LA but felt like they weren’t supported for being mothers. They chose to then begin their own collective and have a place where they could do their art and bring their children as well. The first installation they did was putting together a play structure for their kids. They collected all the supplies and materials themselves along with using heavy equipment to construct the play structure. The fact that they were able to do this on their own as women and mothers goes to show that women can do what men can do. The typical gender rolls wouldn’t consider women to do manual labor but only domestic work. As a group and as individuals they were very strong willed and did what they wanted and what felt was right. All of their work as a collective had a purpose and a meaning. Being that they are working artists that were mothers wasn’t always easy for them but they were supported by each other. The image below is the completed Rainbow Play Structure that the collective constructed. What I found most important and compelling about this collective was their passion for drawing attention to political issues and not just feminist issues. But they were able to relate the issues to the impact they have on mothers and children. For instance the L.A. Guernica piece was a 3D installation that was at the Federal Building in LA. This piece was inspired by a Picasso piece representing what could happen with nuclear war. In their piece you were able to actually walk through it to get a better visual and feeling for the subject matter. It depicted mothers and children in the aftermath of nuclear bombs. The installation was considered “offensive” and they were told to remove it. The image of live vs. death apparently was too disturbing. But the truth isn’t always pretty and the fact that this piece became such a controversy, to me made it more impact full. People should be disturbed by the reality of the situation that they were bringing to light. The type of art that the mothers did was not around for ever, the installations weren’t always displayed long. They would collaborate on different types of work, instead of just paintings and sculptures (which in past history wouldn’t have been considered fine art but more of crafts). The mixed media would high light the talent of each of the artists in the collective, and somehow they were always able to communicate and work together as a team. Another significant piece the Mother Art Collective did was called Flowers for Four Women, this installation told the story of four different refugee women from different Latin American Countries. These women were escaping extreme brutalities in their countries. Once they were here in America they did what ever kind of work they could to take care of their families. This was another example of them highlighting political issues facing women who were also mothers, who faced extreme circumstances and yet somehow they were able to continue on and seek out safety in the United States. I was extremely moved by learning about this piece because it goes to show the strength that women can have and that they can continue to be strong and be productive members of society is just incredible.